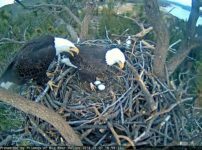 Big Bear, CA, 3/26/18- Since the eggs were laid in early January and the first baby eagle hatched on February 11th, Big Bear has been amazed and excited to view the eagle’s nest cam installed by the non-profit group, the Friends of Big Bear Valley. 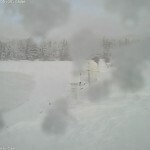 With the second egg hatching on February 12th, and through our series of late winter storms, viewers watched in anticipation daily as the baby eagles grew. The excitement turned to despair last Friday when KBHR initially reported the loss of one of the babies that occurred sometime between Thursday night and early Friday morning. 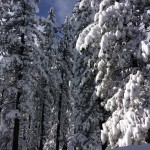 According to Robin Eliason, District Wildlife Biologist for the San Bernardino National Forest Service, the bird’s apparent death was due our latest storm which brought four inches of rain along with temperatures below freezing. Although we don’t know for sure what happened, according to Eliason, as the eaglets are too large to fit under the adults, the bird, named BBB, most likely succumbed to the elements. The other eaglet, named Stormy, appears to be doing okay. 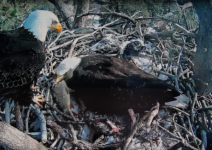 Eagles in the Big Bear territory typically lay their eggs in late December and early January while other Southern California nesting areas lay eggs later for unknown reasons. 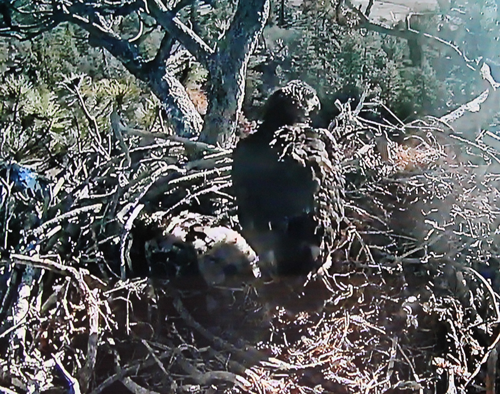 Big Bear’s eagle cam has provided us a front row seat into a world of nature previously not witnessed in Big Bear. The loss of BBB has been a tragic reminder that the course of nature can be unkind.